PSP Audioware EffectPack Flash Sale !!! PSP Audioware have announced a flash sale on their EffectPack through June 15th, 2017! PSP develops high quality audio effect and processor plug-ins. Their products garner rave reviews and endorsements from every corner of the music production, engineering, composition, and post-production worlds, and have become staples in professional and home studios worldwide. Their credo explains a simple philosophy: It’s The Sound That Counts! 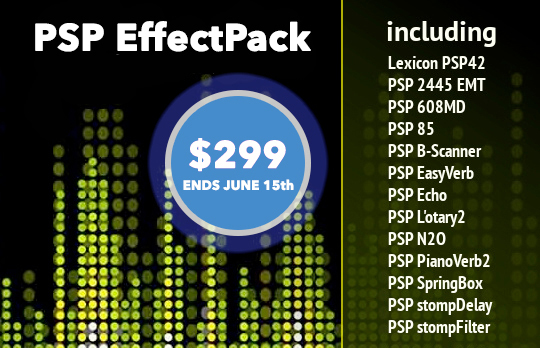 Get the PSP Audioware EffectPack on sale for $299 until June 15th, 2017 at the DontCrack Store. This entry was posted in DontCrack, Plug-ins, Promotions and tagged Compresor, Delay, Effects, EMT, EQ, Filter, Gate, Lexicon, multi-effects, Plate, PSP, PSP Audioware, Reverb. Bookmark the permalink.